Automotive Production Expands Through Automation at Metal Technologies Inc.
As a Tier 2 supplier to the automotive production market, Metal Technologies Inc. of Bloomfield, Ind., must continually seek opportunities to win additional contracts and improve profitability. The company knew that in order to compete with low-labor-cost countries, it needed to rethink its manufacturing processes with a focus on automation. By following a “don’t touch the part” philosophy, Metal Technologies sought to improve its cost per part, process stability, part quality and reliability. According to Metal Technologies, Makino’s automation and process engineering experience was a primary investment consideration, supporting the company in growing and servicing a complete automation solution for day-in, day-out high-volume automotive production. 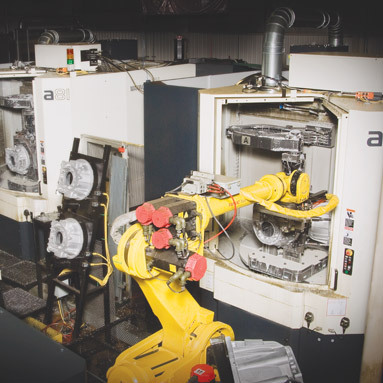 By embracing a fully automated automotive production environment, Metal Technologies has improved part quality and consistency, expanded into new business opportunities, focused its management efforts for efficient and effective operational practices, and can now simultaneously run multiple applications in one cell. The company’s biggest success has been increased production volumes. With both cells producing a combined total of up to 510 parts per day (approximately 255 parts on each cell), Metal Technologies is now producing over 13 times the part volume that it was just three years prior. Additionally, each cell is capable of switching between six different part numbers on the fly, providing the company with enhanced flexibility to run new part order simultaneously.